Apps World is Europe’s largest gathering of developers, mobile and marketing professionals – 8,000 attendees from over 80 countries. 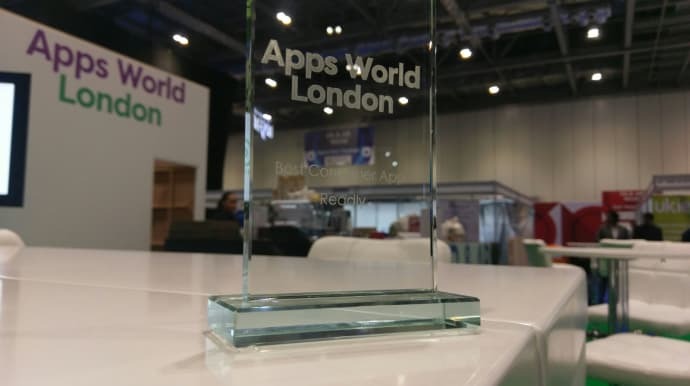 At the event, the Appsters Awards recognise the best and most innovative apps in the industry from a list of over 80 products from the UK and overseas. Readly beat off a strong challenge from high profile apps produced by companies such as EasyJet, Baagloo and Zolt. The judging panel, which reads like a who’s who of the tech world, chose Readly because it was “life-changing value-add” and is having a real impact on how people read magazines. Key elements of the Readly service impressed the judges: CHOICE & VALUE-FOR-MONEY -the £7.99 per month all-you-can-read subscription delivers a range of over 1,700 digital magazines – EASE OF NAVIGATION and Readly’s ongoing programme of UX ENHANCEMENTS. Readly is a digital service which lets customers have unlimited, “all-you-can-read” access to hundreds of national and international magazines in one app for just £7.99 per month – both streamed and downloaded. Ultra-fast, easy-to-use and convenient – each subscriber can access the inventory on up to 5 devices across the major operating systems – the service has an increasing range of functions, including advanced zoom, bookmark, search and sharing tools. In addition to all the consumer benefits, Ready offers a powerful, risk-free route to market for publishers who can also track how their content is being consumed. The Readly operation was launched in Sweden in March 2013, but now has offices in the UK, USA and Germany and a rapidly growing user base in more than 50 countries, making it the world’s leading digital platform for reading magazines online. Readly UK started operation in the Spring of 2014 and now deals with 80 UK publishers, promoting 620 UK magazine brands, in addition to a growing inventory of over 1,000 international titles.